In politics, the coining of slogans is nothing less than the work of literature. Like any good and creative piece of poetry or prose finds resonance with people, smart slogans set the political mood for the nation. ‘Ajeya Bharat, Atal BJP’ is one such smart slogan coined at the party’s national executive that concluded on Sunday. Of course, this is just the beginning as prime minister Narendra Modi seems to have set the party in perpetual election mode. The new slogan is indicative of the party’s mood to contest the coming general election on twin issues – nationalism and the rich legacy of Atal Bihari Vajpayee. What seems to be particularly interesting is the manner in which the nation’s invincibility (‘Ajeya Bharat’) is projected as akin to an unwavering BJP (‘Atal BJP’) as if they are complementary. Looking at the proceedings of the executive, once can discern consistency in the way Modi has been fighting elections; in Gujarat since 2002 and at the national level since 2014. And the elections in 2019 are expected to follow the same course. The slogan comprising four words is clearly intended to take the election discourse beyond the promise of “achche din (good days)” or “abki baar Modi sarkar” in order to take the electorate to a new high which is nation-building. In the executive, the party gave enough indication to pursue this course quite aggressively – much to the discomfiture of its adversaries. And there is little doubt that it would be no holds barred elections. As the sound and fury in the national executive indicated, the Congress would be targeted substantially without inhibition. Take for instance the manner in which BJP president Amit Shah began the executive by launching a scathing attack on the Congress and asking the party’s cadre to go and counter the propaganda of the Congress in general and P Chidambaram in particular. In this case, the naming of Chidambaram is intended to symbolise a particular trend in politics that represents the English-speaking elite which seemed to have a rare convergence of opinion against Modi. The Chidambaram phenomenon is inclusive of Arun Shourie and Yashwant Sinha. Once again Shah left nothing to chance when he emphasised that the BJP’s trump card is Modi and his “charismatic leadership”. He dispelled any scope of ambiguity that might arise among the party leadership about its future political course. The fact that he would lead the 2019 election as the BJP president was a strong indication that the party’s organisational structure would be totally in sync with the leadership and function like well-oiled war machinery. Over the years the strategic genius of Modi lies in conveying the unambiguous message among the party cadre about the BJP’s invincibility. This strategy which brought rich dividends in Gujarat was honed into a fine art during Modi’s stint as the Gujarat chief minister from 2001 to 2014. The national executive in Delhi seemed to be replicating that strategy in toto. Shah egged on party workers not to be misled by the opposition’s propaganda and sought to convince them by saying “victory will be ours”. In Modi’s address, the executive was convinced about not only the invincibility of the BJP but also of the infallibility of the party leadership. ‘Ajeya Bharat’ and ‘Atal BJP’ are therefore carefully crafted to align the BJP’s identity with India. 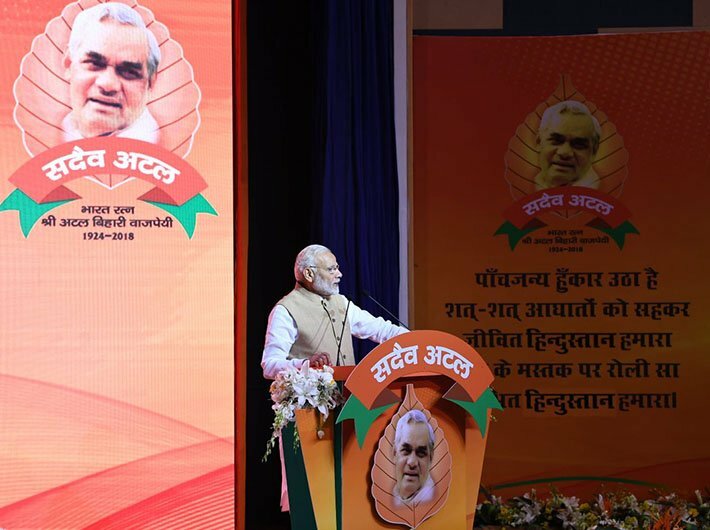 Contrary to individualistic slogans centring on the personality, ‘Atal BJP’ is clearly intended to give preference to the organisation and reaping the emotional connect with the legacy of Vajpayee. Unlike the “Shining India” that reflected hubris and was divorced of realities, the new slogan is apparently secular in its content but intended to induce a variant of nationalism aligned with the Sangh Parivar’s idea of India. Obviously, the message was meant to enthuse the party’s cadre and mobilise the organisational structure towards one goal – nation-building. The obvious implication is that the party building is akin to the nation-building. Given the cultural background and training of workers of the BJP and the Sangh Parivar, such slogans tend to find instant resonance among them. But those who think that the BJP would rest on the laurels of Modi’s achievements only to fail in the end are clearly ignoring the elephant in the room. This psychological booster is adequately backed by carefully planned programmes for the cadres in the run-up to the 2019 elections. In the memory of Vajpayee, an elaborate programme of mass contact across the country is planned. Another programme is planned to counter the opposition’s offensive by educating people by Modi’s regime and the previous Congress regimes led by Nehru-Gandhi family. There is little doubt that the BJP in this election would heavily bank on its millions of foot soldiers and their ability to convince the masses about the Modi government’s achievements. Given the extraordinary organisational expansion of the BJP, the party leadership intends to play on its strength which the Congress-led alliance would be singularly lacking. Once again Modi insisted on mobilising trained cadres at the booth level across the country to mobilise voters for the BJP for a dream of “invincible India”. Inherent in this dream is the invincibility of the BJP and Modi. Obviously, the conclusion of the two-day executive on Sunday will mark the beginning of a political thriller whose climax will be awaited with bated breath.